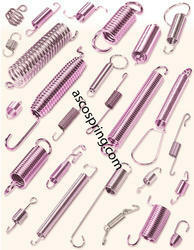 Our range of products include custom springs, clock springs and tension springs. We bring a qualitative products from our state of the art manufacturing unit, Custom Springs, that are helical in shape and have an open coil. These springs are used to apply additional force to the compression along its axis.We are a major Custom Springs manufacturers, exporters from West Bengal, rendering world class products range at highly competitive prices. Our Custom Springs offers great resistance to high compression force and can effectively and efficiently accumulate considerable mechanical energy in them. The coil is made up of round wire and is wrapped in cylindrical shapes with an unchanging and larger gap between the successive coils. The spring is flexible enough to contract and expand while the force is applied by the load. 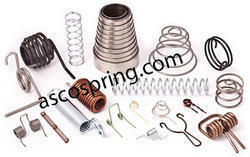 Owing the team of expert engineers and workers, we are engaged in offering high quality range of Clock Springs. These are widely used in various applications and are manufactured as per the requirements of our clients. Further, the raw material used in the manufacturing is procured from the reliable vendors of the industries. 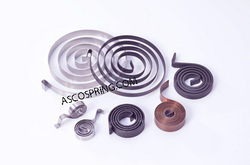 Asco Extension Springs manufacturer all types dimension accurate range of Extension Spring which is customized as per the specifications of our clients. Extension Spring are qualitatively superior and are used in a industries as well as circuit breakers. Bar Dia. : Up to 20mm. Total Length: Up to 1500 mm. Raw material: All suitable quality customer requirements. Looking for Custom Springs ?